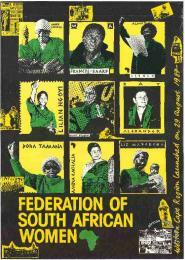 Description: This poster is an offset litho in black, green and yellow, produced by FEDSAW, Western Cape. This poster honours leading women in the South African struggle at the launch of the Western Cape Region of FEDSAW. These women include Annie Silinga; Francis Baard; Albertina Sisulu; Lilian Ngoyi; Helen Joseph; Ray Alexander; Dora Tamana; Amina Cachalia; and Liz Mafekeng. The main text reads: "FEDERATION OF SOUTH AFRICAN WOMEN : Western Cape Region Launched on 29 August 1987".Digitised by Specialised Archival Solutions in 2009. Reproduced in "Images of Defiance: South African Resistance posters in the 1980s" on page 86 (number 52) of the 1991 SAHA / Ravan Press edition and the 2004 SAHA / STE Publishers edition. It is also included in the SAHA Exhibition Kit - Women.